The rich baritone and personal reflections captured on Dusty Wright’s fourth solo album If We Never … transport listeners to a time when troubadour singer-songwriters like Gordon Lightfoot and Harry Chapin ruled the musical landscape – and a universe in which those FM-pop staples would moonlight after hours in dimly-lit clubs with the Velvet Underground. Despite those aging touchstones, songs like the introspective “Comfort Me” and uptempo “Sometimes I” are as contemporary and immediate as conversation at your local coffee shop. Much of Wright’s material surveys wounds and casualties on the battlefield of love. Although “Uncertain” describes the unpredictable nature of affairs of the heart, Goeke’s melancholy cello implies that heartache is a foregone conclusion. Within the sly “Lustful Blues” we recognize that lovers are fully capable of dealing out the pain themselves, sneaking around the confines of their everyday relationships to indulge in pleasures so wrong, they “must be right.” Men, if nothing else, are suckers. “Adam was easily swayed,” Wright admits with a wink. The title track ties a ribbon on the song cycle. 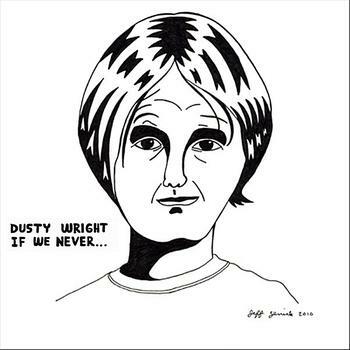 “If We Never …” offers tribute to a departed friend, while ruminating on the axiom “it is better to have loved and lost than never to have loved at all.” Judging by the album, Wright has both loved and lost, and If We Never … is his way to mourn and celebrate all of it.